Pathways to Adulthood and Marriage: Teenagers’ Attitudes, Expectations, and Relationship Patterns. 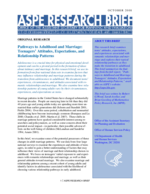 ASPE Research Brief. Marriage patterns in the United States have changed substantially in recent decades. People are marrying later in life than they did 40 years ago and young adults today are spending more time unmarried than earlier generations did (Schoen and Standish 2001; Fields 2004). Over this same period, cohabitation and nonmarital childbearing have become increasingly common (Bumpass and Lu 2000; Chandra et al. 2005; Martin et al. 2007). These shifts in marriage patterns have sparked considerable interest among researchers and policymakers, as well as some concern about their potential social impact — in particular, their possible adverse effects on the well-being of children (McLanahan and Sandefur 1994; Amato 2001). In this brief, we examine some of the potential precursors of these changes in adult marriage patterns. We use data from four large national surveys to examine the experiences and attitudes of teenagers, in order to gain a better understanding of factors that may influence their views of marriage and their relationship choices in adulthood. We focus on teenagers’ initial exposure to and experiences with romantic relationships and marriage, as well as their general attitudes toward marriage. We also examine marriage and relationship patterns among a recent cohort of young adults and identify factors in adolescence associated with the likelihood of choosing various relationship pathways in early adulthood. This information is useful for several reasons. First, trends in teenage attitudes toward marriage can provide an indication of whether current trends in adult marriage patterns are likely to continue. In addition, information on teen romantic relationships is an important indicator of adolescent health and well-being, making this information of interest to a range of policymakers and researchers concerned with the status of teens. Finally, the growing interest in marriage and relationship skills programs that serve adolescents has created a need for improved research evidence concerning teens' romantic relationships and attitudes toward marriage (Karney et al. 2007). This information can help program developers design relationship and marriage education programs that are age-appropriate and in tune with the experiences of today’s youth. It can also help policymakers and program operators better assess the needs of teens in their communities and choose program models that are most appropriate for the teens they serve.